I've missed the Southern Theater. Last season I had a season package that introduced me to several small theater companies I hadn't heard of. Each show was unique and innovative and sometimes a little weird (in a good way). Unfortunately the last show in my package was cancelled due to financial troubles, from which they're still recovering. 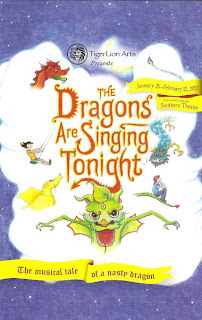 So I was happy to hear* about the new musical The Dragons are Singing Tonight, which sounded every bit as interesting as other things I've seen at the Southern. And it is. So many people and groups are involved in this show that I don't know whom to credit for what, so I won't even try. The Dragons are Singing Tonight is based on a book of poems by Jack Prelutsky and is a collaboration of TigerLion Arts, Minnesota Boychoir, Puppet Farm Arts, Circus Juventas, In the Heart of the Beast, four actors, a composer, and twelve musicians, and more, all of whom seemed to have a hand in what's being presented at the Southern Theater. And the result is delightful and whimsical and moving and silly and fun. A boy (Maxwell Chonk Thao) wishes for a dragon of his own, and a girl (the luminescent Isabella Dawis), who herself has a dozen dragons, leads him to an egg in the garden which eventually hatches into a baby dragon. But being a dragon-owner is harder than he thought, as Nasty (so named because of his breath and attitude) grows bigger and more independent. The boy only wants Nasty to obey, so he puts chains on the dragon and makes him do his bidding. But the girl warns him, "give him room or he will boom!" And boom he does. The boy eventually learns that he can't control Nasty; he has to let the dragon be himself so that they can both be happy. Something that every pet owner (and Daenerys Targaryen) knows. Nasty is portrayed by two actors as he grows from a spark to a huge dragon. Elise Langer (who I've seen in several Ten Thousand Things productions) and Tyson Forbes (who's appeared many times on the Guthrie stage) are both amazing and work together so well to give life to the growing series of puppets. At times they speak in unison, giving more dimension to Nasty. The full-grown dragon puppet is graceful and lifelike, with Elise inside the body of the puppet and Tyson directing its head and expressions. The two humans and the puppet combine to create a loveable full character. Jack Prelutsky's poems have been beautifully set to music by composer Laurie MacGregor. The songs are fun and catchy, sad and thoughtful, playful and whimsical. I find they're still running through my head two days later. "If you don't believe in dragons, it is curiously true, that the dragons you disparage, choose to not believe in you." These are great poems for children that don't talk down to them. The program includes a glossary of terms (such as disparage) that might be challenging for younger children. The awesome twelve-piece band crammed into the side of the stage bring the words to life. The Minnesota Boychoir joins the band and the actors in telling the story, and they're completely adorable - acting the songs instead of merely singing them. Last but not least, three lovely and graceful aerialists perform on ropes and swings and add to magic. 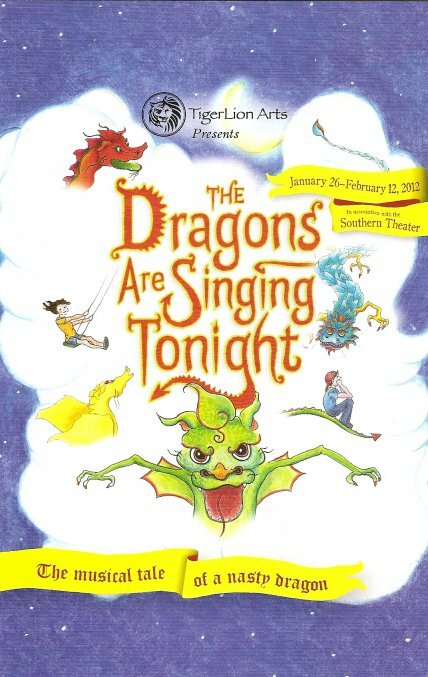 *I received two complementary tickets to The Dragons are Singing Tonight.